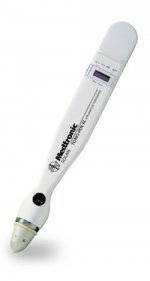 A handheld, compact, portable applanation tonometer based on the same principle as the Mackay-Marg tonometer. It incorporates its own battery power supply and liquid crystal digital readout and provides both an intraocular pressure readout and an indicator of the reliability of the instrument. The results correlate well with the tranditional Goldmann tonometer, although it slightly overestimates low IOPs and underestimates high IOPs. It can take measurements in an eye with an irregular cornea or through a soft contact lens and in a variety of clinical settings.